When you endorse your connections’ skills and expertise, do you simply click Endorse next to the skills with the highest number of endorsements? You may not be doing your connections a favor by doing this; but it’s not entirely your fault. Your valued connections should be guiding you through the process, and you should follow their wishes. Endorsees, you may be unaware that you can move specific skills and expertise toward the top of your list as a way to highlight their importance. Without doing this, your skills will be listed in highest to lowest number of endorsements. Which works out fine if your highest number of endorsements properly brand you. But in some cases your skills are not being endorsed in a manner that tells others how you want to build your brand. One of my connections aptly illustrates which skills he wants endorsed to better brand him. He lists Social Selling ( a mere 13 endorsements) listed above LinkedIn (98), LinkedIn Training (74), and so forth. He’s obviously sending a message to his connections. Now simply move the skills in the order you’d like them to appear. I’ve moved LinkedIn (33 endorsements) ahead of Workshop Facilitation (98+) and Blogging (41) ahead of Interviews (82), as I want these two skills highlighted. So if you’re endorsing your connections, take the hint. The skills your savvy connections want endorsed first are the top five to 10, not the bottom 10. Endorse them for those skills first and then endorse them for the others. People often ask me if I see value in endorsements. I tell them only if the endorsers are aware or have witnessed the endorsees perform the skills for which they’re being endorsed. However, if LinkedIn wants us to endorse our connections–even those we haven’t seen perform–we can only trust their word on their proficient skills. I asked one of my connections which of his skills he wanted endorsed. His simple response was the top five because those are the skills he is strongest at. I wouldn’t know without asking him because he lives in California, and I’ve never seen him in action. Nonetheless, like Lin Sanity, I was caught up in endorsing people. Take the hint if you’d like to endorse me by clicking Endorse next to my top five skills, because I’ve arranged them in order of preference. I’m pretty sure I perform those skills very well. I’d do the same for you. This entry was posted in Career Search, LinkedIn and tagged Endorsements, LinkedIn, LinkedIn Connections, LinkedIn profile, Skills and Expertise on March 27, 2014 by Things Career Related. Great post Bob. I have a question, Have you seen an increase in the endorsements for LinkedIn since you moved it to the top? I agree with that endorsements are really a reflection of your personal branding. What are you doing to spread your reputation as a subject matter expert. If you are writing, and or speaking at professional associations, and contributing to LinkedIn group discussions, your expertise will be more likely to stand out, and endorsements will naturally follow. Thanks for the great post Bob! Thanks, Greg. I personally haven’t seen an increase in endorsements, nor have I been endorsed for the skills/areas of expertise I want. I figure people would take the hint given that my LinkedIn and blogging skills are lower than other skills I’m not too psyched to highlight. Of course you know the person I’m writing about who told me his top 10 skills are the ones he feels are the strongest. People should trust the endorsee’s word on this matter. I think some people pay attention to endorsements, and they may be a way to brand oneself, but I see more value in recommendations. That being said, where are recommendations rooted? That’s right, in the cellar of the profile. I fear they’re on their way out. Tis a shame, as many business owners rely on testimonials. Some even used to follow their Summary with Recommendations. I digress. Thanks for being supportive. Why do you say “where are recommendations rooted? That’s right, in the cellar of the profile.” Recommendations are interleaved with the positions they apply to… which are near the top of the profile. @ vlbrown, You are correct that recommendations are attached to the jobs that are recommended, however only a few show for each position. The section for all the visible recommendations is at the bottom of the profile. LinkedIn allows you to move around many sections, however, it doesn’t allow you to move up the recommendations, which I wish they did. That is what Bob is referring to. I agree with him wholeheartedly. Bob, I couldn’t agree with you more about recommendations. There is much more value in them. However I am finding a lot of companies creating policies prohibiting recommending, because they fear any liability in case the recommendation is relied on in the hiring process. 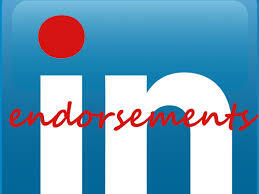 On the endorsement side, I moved one skill up (LinkedIn) and since then, have gotten more endorsements. So it may work. Good experiment anyway. Also, now when you click to manage endorsements, you can choose if you want to be endorsed, if you want LinkedIn to give recommendations, or if you want to see LinkedIn’s recommendations when you go to a profile. Thanks, Greg. 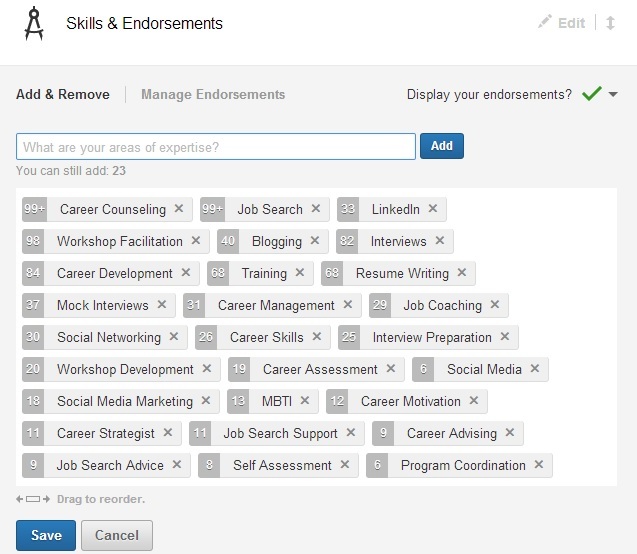 Yeah, I noticed the option of being endorsed and asking LinkedIn for suggestions for whom to endorse, as well as suggesting to my connections what skills to endorse me for. I promptly turned both those options off. My wish is that 1) people will experience me delivering the skills or 2) will endorse me for what I think I’m strong at, ergo rearranging the skills. I’m glad you’ve gotten more endorsements for LinkedIn. Some Thursday night I’ll have the energy to listen to your webinar. Six o’clock your time is nine o’clock my time. I’m a morning person. I wish there was a way to combine endorsements, e.g. I have “Lnux and Unix as separate keywords and I’d love to combine them. Similarly “Software Doc” and “Technical Doc”. Great article; I really like the part about asking others which skills they would most like endorsed. You did this with me, and it was very nice to be asked, Thank you! (And do let me know if there is anything you would like endorsed that I might have missed).